“I had gone back to school.” [Lilith] said. “I was majoring in anthropology.” She laughed out bitterly. “I suppose I could think of this as fieldwork – but how the hell can I get out of the field? (1987: 262-3)? I inserted this image of Lilith into my own photo taken during a sunburst in the middle of a blizzard in Iqaluit, Nunavut (2003). 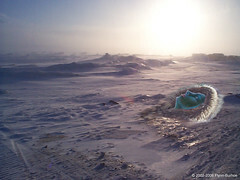 Lilith is protected by a sunburst parka using a third Adobe layer. I wish I could have found a similar protection for my own spirit. Images of Lilith’s experiences flashed through my mind frequently as my own conflicted role as impassioned researcher crunched against the sea ice of academic ‘professionalism’ and detachment which came to resemble convenient apathy for inconvenient truths. When the ice pan is disturbed by currents under the ice, hummocks form in these dramatic shapes resonating with the emergence of mountain ranges — not miniature but not the Rockies either. In parts of the frozen seas these hummocks impede winter travel. Dog sleds and snow machines navigate around them. Afflicktion is derived from the term flicktion developed on Flickr by innovator Andrew Losowsky to describe his unique, creative response to non-linear aspects of blogging in a series entitled The Doorbells of Florence. This work-in-progress series on Flickr and Speechless is an attempt to thaw out my afflictional misadventures with social and cultural institutions as a PhD candidate and contract lecturer — and at times fly-in (Flynn) professor — in remote northern communities more .